Jack Ma– CEO of The Alibaba Group and president of the Carol Bartz fan club— was on Charlie Rose this week, and while he didn’t offer any more insight into the Yahoo situation, he said a lot of interesting things. Ma is a force. He’s going at half-normal-speed in this video. I saw him speak at the World Economic Forum last week in Chinese and the translators couldn’t keep up with him. They kept tagging in-and-out because he exhausted them so quickly. 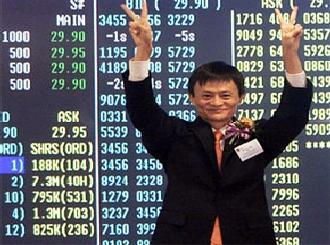 Ma says three things are at the core of his company and business philosophy, calling them “his religion” on the show. The first is that technology isn’t Alibaba’s core competency, rather it’s the company’s culture. That first bit is the surprising part– Ma goes on and on about how untechnical he is. That’s something I’ve never heard any executive of a tech company say, even if they aren’t technical. Ma says “I know nothing about technology,” adding he can’t write code and the most he can do is send and receive emails. That takes some confidence as a leader to be so bold about what you don’t know. The third element is that “Small is beautiful”– strange coming from the guy who built one of the largest Internet companies in the largest online market in the largest country in the world. Few things are “small” in China and fewer still are praised for being small. But Ma’s platforms are powered by millions and millions of small business people who couldn’t do business any other way in China. He says that in the US, real world business infrastructure is so good that ecommerce is “dessert” but in China it’s “the main course.” He thinks the future of China is empowering lots of entrepreneurs in the classic, small-business-man sense of the word. What China needs most he says are hundreds of millions of jobs, and he thinks lots of small businesses are the answer not more giants like Alibaba. Technology is merely a tool; shareholders are the least important constituency; and small is better than big. This is how Jack Ma views the Internet and the world differently than a typical Valley CEO. Given he’s built the largest ecommerce and online payment platforms in China while most Valley companies have failed to get off the ground, the difference in mindset might well be part of the reason why. The full video is here, and there’s a clip below.